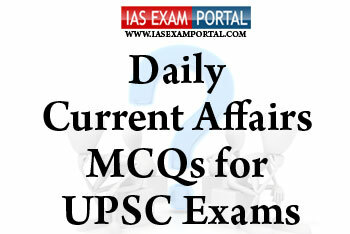 Current Affairs MCQ for UPSC Exams - 25 JANUARY 2019 | IAS EXAM PORTAL - India's Largest Community for UPSC Exam Aspirants. Q1. After months of exhaustive ground and flight trials, the indigenous produced bio-fuel has been finally cleared for use by the premier airworthiness certification agency of the country. Which of the following statements regarding this are true ? 1) This is a significant development which could reduce the carbon emissions and help India become a green fuel production hub. 2) The bio-jet fuel has been produced from seeds of Jatropha plant sourced from Chhattisgarh and processed at CSIR-IIP’s lab at Dehradun. 3) BIS has in collaboration with IAF, research organisations and the industry brought out a new standard for Aviation Turbine Fuelsto use bio-jet fuel on all military and civilian aircraft. Q2. The IT act 2000 came to force on 17th October 2000 being the first act to govern the cyberspace in India.The act amended which of the following existing laws in India ? 1) The JSS has been instrumental in skill training and introducing avenues of entrepreneurship among the socio-economically backward and educationally disadvantaged groups such as neo-literates, semi-literates, SCs, STs, women and girls, slum dwellers, migrant workers. 2) At present the JSS is established mainly in the Left Wing Extremism ( LWE ) affected areas to promote skill development of the youth in the region and help them connect back into mainstream economy. 3) Centre has brought the JSS under the National skill qualification framework( NSQF) aligning all skilling activities to a common cause of skill development at the district and village level. Q4. Which of the statements regarding e-courts initiative by the government of India are true ? 1) The eCourts project has made significant progress under the guidance of e-Committee of Supreme Court of India in computerizing district and subordinate courts of the country through installation of case information software, hardware and local area network in courts. 2) They are also being connected on Wide Area Network through a dedicated network offering bandwidth upto 100 Mbps. 3) In order to provide efficient and time-bound access to the Courts services to litigant public, who are on the other side of the digital divide and don’t have access to internet, the Department of Justice has decided to deliver eCourts services to them through around 2 lakh Common Service Centres (CSCs). Q5. Which of the following countries is the first one in WHO’s South –east asian region to defeat trachoma, world’s leading infectious cause of blindness.